What is a Churn-and-Burn Website and Should I Build One? Churn and burn is a common phrase among black hat marketers, and there’s a reason for that; it’s a firmly black hat strategy. As far as I know, there’s no real way to use it legitimately. It’s also called “rank and bank” to give you an idea of the mindset that goes into setting it up. First, you register three different domain names. You have domain A, domain B, and domain C.
Domain A should be an expired domain with a little authority and preferably no search penalty. As you can see, this makes domains previously used for churn and burn campaigns unfeasible. Domain B should be a new domain, and it should be a little relevant to the general niche you’re targeting. Don’t waste a good domain on this, though; it’s more of a filter than a website. Domain C should be a more legitimate domain, and it’s where your site is going to be hosted. It doesn’t need to be an expired domain, nor does it need to be a super high quality domain, but those things can help get you off the ground. Implement a 301 redirect from domain A to domain B. This will pass much of the old authority and link juice to the filter site. You will also want to implement another redirect from domain B to domain C. This filters any black hat nature from domain A and puts upward SEO pressure on domain C.
At this point, you build a website on domain C. This website is going to be modular, easy to rebrand, easy to install, and trivial to maintain. We’re not talking about a long-term project with a huge blog or anything here. We’re talking more like one of those “work from home” scam sites. You know how you see those pop up time and again on different domains? That’s because they’re following this kind of strategy. Once you have the website, you force it to rank. It already has a little value flowing in from domain A filtered through domain B. What you do is then use some kind of automated link builder, one of those black hat tools that puts your links on spam sites all over the web. Maybe 20% of those links end up on sites that aren’t deindexed, but sometimes that’s all you need. It’s important here to remember that you’re not pointing these programs at your money domain, domain C. Rather, you’re pointing them at domain A. That way, the value – and the penalties – end up on domain A, and only the value is passed to domain B, which is then passed to your money site. 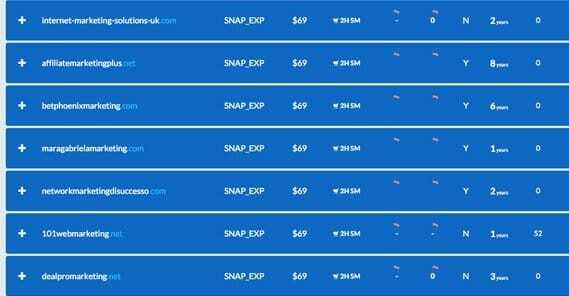 In the image below: Many sites let you buy expired domains and organize them based on how many links they have, such as Freshdrop.com. During this step, it’s easy to be detected and have your IP flagged as malicious or abusive. This is where many black hats invest in proxies to help hide their involvement and keep their main site as clean-looking as possible. At this point you monetize the site on domain C. There are a whole bunch of ways to monetize a site like this. The easiest is to use any of a dozen ad networks, sites like AdSense or MaxBounty or PeerFly. Usually, these sites are more like landing pages with a focused affiliate lead, and that’s how you make most of your money; the rest comes from ads on the side. At any rate, it’s up to you what monetization strategy you use, if you’re trying to do this at all. At this point you’re put into a holding pattern. You have value coming in, you have money coming out. This will stay in place for a while, until Google catches on that your site is ranking entirely from links coming from that one domain. They will penalize your site, and overnight your value in turns worthless and your money out disappears. What you do now is manually deindex your own money site on domain C. By removing it from the index, you protect yourself from immediate penalties in the next step. The next step is to create a new domain, domain D, and upload the contents of your website to this new domain. This new domain isn’t penalized, and the content is fine for now; it isn’t a duplicate of anything, because the old site was removed from the index. 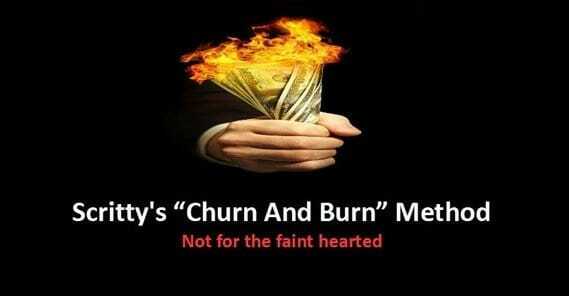 That’s what the “burn” part of churn and burn is all about; burning the old to make way for the new. Redirect domain B to domain D instead of domain C, and let domain C lapse. You don’t care about it any more. Cancel your registration if you want, to avoid spending more money on it. Repeat as necessary each time your money site earns a penalty. There are a lot of things wrong with the churn and burn plan. It’s really only useful for a very small selection of people, and it can be actively harmful to many. First of all, who can and cannot use it? The people who can use it are the anonymous webmasters who just want to exploit loopholes in systems to make money. They don’t care about selling a product, they don’t care about building a brand, and they don’t care about forming a reputation for themselves. They don’t want to build a lasting legacy, they want to cash out as quickly as possible. On the other side of the coin, anyone who cares about their brand, their reputation, or the authority of their content absolutely cannot use this method. Anyone who has a long term plan in mind, who wants their name attached to their site, or who wants to become a resource won’t be able to use this strategy effectively. So what is wrong with the method, what flaws does it have, and can it ever be made legitimate? You burn through domains and can’t easily recover them. Each time your main site is hit and you deindex it, it’s done. There’s no easy way to get rid of the penalty, because it happened due to the strategies you’re using to rank. 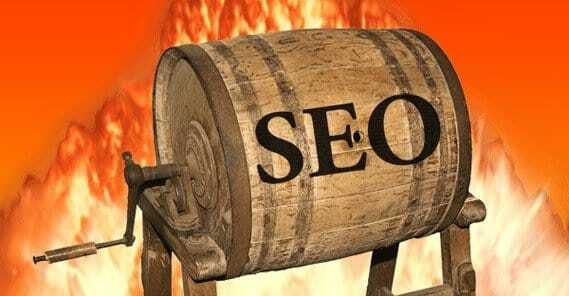 You would have to establish a completely new site, kill the spammy redirects, and disavow all the backlinks. It’s not like domains are all that expensive most of the time. It’s not a huge expense to circulate through domains. The problem you’ll encounter is more one of usage. Your first site will be the best keyword you have, and after that they get further and further away from the ideal. You leave a littering of wasted potential behind, used and abused for weeks or months before you’re forced to cut and run. You have to constantly migrate your content from site to site. There’s always a hassle involved in this process, and it’s always possible that you lose something along the way. 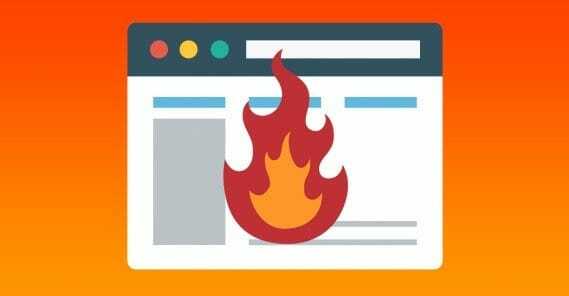 Many people running churn and burn schemes do it with free hosts like WordPress.com because it requires a minimal amount of setup, but that adds its own risks. WordPress can shut down your site at any time, and if they find you’ve been monetizing in a way they don’t like, they can and will take action. Just check out this case study for an example. You can get banned from your monetization network. This is a huge problem if you’re trying to monetize something like AdSense, and it can even be a problem with other networks, like Amazon Affiliates or CJ. There’s an inherent risk with using black hat techniques with marketing of all sorts. Brands advertising through you don’t necessarily want their products being sold on a site that uses illegitimate techniques, and those brands try to pressure networks into terminating the accounts of people using strategies like churn and burn. You can have your source domains banned as well. Google isn’t stupid. It knows what the churn and burn strategy entails. It knows all about the various backlink builder software applications, and you can bet they have people internally using them and reverse-engineering them to track their effects and come up with ways to identify sites that use them. In fact, the entire strategy only exists based on the whims of Google. Sure, when Google makes a fix and pushes it to the algorithm as a whole, black hats will find a way around it and work on another strategy. That’s the dance you play. People out there working on white hat strategies benefit every time gray and black hat marketers are knocked down a peg, and they laugh in their success. Black hat marketers have an issue with long term growth. Your money site will be demolished sooner or later; it always happens. While you’re fighting to recover your previous income, white hats are growing. Google doesn’t always save value on redirects from expired domains. Experiments have been done on various types of links in various situations, to see what does and doesn’t benefit a site. You can read some reports here. Buying an expired domain changes the whois information, which tells Google to stop it from passing link juice. It’s as if all previous links were tagged with NoFollow. The only value you get for making Domain A an expired domain is the age, which makes it easier to quickly rank. Redirecting links from a domain you buy, expired or not, might invalidate those links. It depends on the sort of change, the sort of redirect, and how Google’s algorithm is feeling that day. The only way buying a domain maintains link quality is when you maintain the site that already exists, which isn’t possible with expired domains. If you don’t mask your whois data, Google can penalize your unrelated sites. Google can and will look up the whois information – that is, the company you registered your domain through, your contact information, the company you claim to represent, and all the rest. They will cross-reference this information with other sites that bear similar characteristics, or are in similar niches, or just have the same contact information. That means if you’re running one legitimate white hat site and decide to experiment with black hat techniques like the churn and burn, you’re not safe. Even if you’re not crosslinking from one to the other, even if you’re not directing any black hat techniques to your white hat site, Google still identifies you personally as a black hat marketer. When they find your other site, they assume you used some form of black hat marketing to rank it, and they will scrutinize you harder. They may also penalize you more harshly for minor mistakes, because you lost the benefit of the doubt. If you don’t burn your old site properly you can earn copied content penalties. Google doesn’t necessarily reference something like the wayback machine, but they can get signals crossed. When you go to burn your old site by deindexing it, you need to then wait long enough for the deindexing to propagate throughout Google’s servers and backups before you can begin indexing the new site. This is at minimum a delay in returning to profitability. At maximum, it can nuke your new domain immediately for copied content, forcing you to start over yet again. If you’re particularly unlucky, you might end up having to recreate all of your content, which can ruin any testing or optimization you had done up to that point. You can’t use Google tools unless you want to invite a penalty. Webmaster tools exists for you solely to emergency deindex your content when it’s flagged with a penalty. You can’t use Analytics without inviting scrutiny. Essentially, you’re walking a thin line. On one side of the line is a sheer drop precipitated by making a mistake, one that leads to Google detecting your abuse and punishing you accordingly. On the other side of the line is another sheer drop, this one into the valley of unprofitability. If you’re not aggressive enough, if you’re not set up properly in the right niche, you’ll end up struggling to make your domain payments; you won’t be making nearly enough money for the whole exercise to be worth the time. It’s only when you tread the line absolutely perfectly that you’re able to make bank, and even then, sooner or later that razor’s edge turns into nothingness and you’re faced with a pitfall on every side. On the other side of the coin, we know white hat strategies work. They’re the recommended path. They might not grow as quickly, but they don’t have so low a ceiling. They won’t be caught and penalized, because there’s nothing to penalize. It’s a difference in outlooks, in ideologies. Black hat marketers are in it for quick bucks, quick turnovers, and quick retirements. White hat marketers are in it for the branding, the career, the potential to become someone on the Fortune 500 list. It’s a little ironic to me that black hat marketers spend incredible amounts of time and effort setting up projects that are by their definition destined to fail, when they could spend an equivalent amount of time and energy setting up something more honest, less exploitive, and less likely to crash down around them. Yet, they know this. They know it going in. Why do you do it? Why is churn and burn an appealing strategy? I’m genuinely curious. I didn’t know about this technique to rank websites… But it looks pretty complicated, just to see the whole thing tumbling down! Great post anyway, thanks!